﻿Microsoft 365 and its suite of office productivity tools, has some new features for 2019. Microsoft 365, formerly Office 365, is the collection of business software for publishing, communication, mail, presentation, and accounting. The suite of programs including Microsoft Word, Excel, Publisher, Outlook, and PowerPoint have been designed to make work simpler and provide a way for greater collaboration and sharing to take place between internal and external work teams. Many of these new features should be available to users in Q1 of 2019. These include enhancements to PowerPoint, Word, Outlook, and Teams, to name a few of the offerings available to Microsoft 365 users. Each of these new features is discussed in further detail below. This is an overview of what’s new, how the feature works and what you as a business user should expect. Intelligent proofing has come to Microsoft PowerPoint. It is similar to the functionality users have known in Microsoft Word and that has also been available in Microsoft Outlook since the last part of 2018. It takes the machine learning capabilities and natural language process that exists in the program to proof, edit, and make recommendations to users based on the content of the presentation being created. Things like wrong word choices, misspelled words, and improper grammar are detected in this feature added to PowerPoint. Office Insider users should have access to this enhanced feature with Microsoft 365 users coming online shortly in Q1 of 2019. To determine its availability, a user simply can click on SELECT FILE > OPTIONS > PROOFING. The boxes, “Frequently confused words” and “Mark grammar errors as you type,” should be checked, indicating the availability of the feature. An additional feature that should be a welcome enhancement for users is the availability of forms in PowerPoint. Feedback, surveys, and questionnaires can be administered simply and easily with the adding of forms to this software program. Forms has been a standard within Word and have now come to PowerPoint. Users interacting with students or in a training environment looking to administer quizzes, or questionnaires with participants now have the facility to do so within PowerPoint. Writing with Microsoft Word has become even easier in 2019. A new feature allows users to bookmark, or rather, create notes within a document as a reminder to return to that spot in a document. The feature is called inline TODO and it is as simple as typing the word “TODO” (all CAPS) as a placeholder in a document. The user will then have the ability to type a note as a reminder of some thought or action they wish to insert and can choose to continue writing or exit. The TODO placeholder is perfect for those times when a user loses their train of thought and needs to look up additional information or seek the advice or opinions of other members of the team for clarification. These entries are tracked as To-Dos in the To-Do app, which can be viewed online or on a mobile basis. Every time a user returns to the document, the to-dos that have been coded in the document appear instantly as a reminder. A user (logged into SharePoint or creating a document shared in OneDrive) can also use the “@mention” feature to direct a message to another user within the team to look at the TODO denotation in the document. Office Insider users have immediate access to feature (in preview mode) while Microsoft 365 users will have access to TODO soon in 2019. Task features that used to be available only in the desktop version of Microsoft Outlook have been released to web-based users. It allows for greater mobility and less dependency on the desktop for managing important tasks and project workflow. The ability to drop emails into the task icon previously has been limited to desktop users. New for 2019 is the ability of web-based Outlook users to also drop related emails into the task icon in order to properly manage and stay informed on any changes, updates, and any other important communications that may impact a given task. The same goes for the ability to schedule tasks on a calendar. Where before a user would have been dependent on the desktop version of Outlook to perform scheduling, the new web-based enhancement allows users to perform the same function online. Once scheduling of a task takes place on the user’s calendar, it will be carried over to a mobile user’s To-Do app. Note that this capability is only available to those business customers opted-in the new Outlook. Skype has been a standard established for years for bringing teams together. This is especially true of those teams that are remote or located in different places. It has been an integral part of Microsoft’s collaboration approach, that is, until the advent of Microsoft Teams. The Microsoft developers have taken their newer approach to team collaboration further by enabling iOS (Apple-based users) and Android (Google-based users and others) mobile functionality to stay connected to their teams. A meetings icon allows for the easy scheduling of meetings, while “Quiet Hours” gives users the ability to limit push notifications during those important moments of a user’s life (i.e. family time, dinner, vacation, etc.). Finding other team members directly from mobile devices is made easier too with enhancements made to the Teams app. 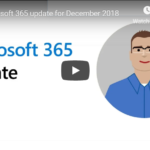 Stay on top of the enhancements and changes made to Microsoft 365. As the software package evolves to meet the needs of its users, it’s important to educate those users within your various workgroups and keep them up-to-date. An educated user is a powerful one; understanding how Microsoft is making business work better helps you do better business.